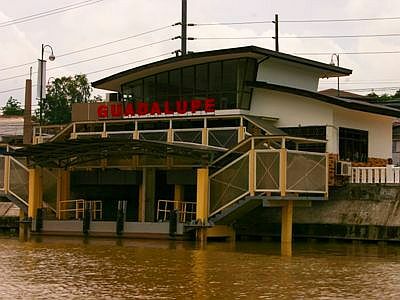 UPDATE: This Pasig River Ferry service was discontinued in 2011. Government is mulling reviving the service in 2014 to aid in declogging the Metro Manila of heavy traffic but it needs additional capital and investors to revive it. UPDATE February 17, 2014: accroding to this news report, the MMDA together with the DOTC will resurrect the Pasig River Ferry in April 2014 to ease the traffic woes due to the 15 road projects in Metro Manila. Proposed routes are Guadalupe to Intramuros in Manila and Guadalupe to Pinagbuhatan in Pasig City. this project was planned a long time ago but shelved same number to time. However, this time it's all go judging from the visible construction of modern airconditioned terminals with floating pontoons that go along with the rising and ebbing of the tide of the once pristine and beautiful river that inspired the muses of yore. This Pasig River Ferry service was discontinued in 2011. Government is mulling reviving the service in 2014 to aid in declogging the Metro Manila of heavy traffic but it needs additional capital and investors to revive it. Hey! This is a good news! Sana matapos na sya at masubukan. Mas maganda pa nga ang river system natin kesa sa Singapore. How's the ferry? Malinis ba naman? Bka mabaho? yesterday was my first experience to ride the ferry! it was great. the ferry was clean, air conditioned and with a big LCD tv playing some movies. you'll see different sights including the malacañang palace. fare was 30pesos from guadalupe to quiapo. I plan to explore the Pasig ferry when I get back to Pinas this February. I plan to board it in Guadalupe and alight in Escolta. From Escolta, what else is there to go and do? I plan ro start early in the morning and explore Escolta vicinity until way over sunset. guys, any idea if the Pasig River Ferry is still operational? Got a chance to pass by Guadalupe last Sunday, but the doors are closed. Could it be they are now just operating from Monday to Friday? Please confirm. the last time i called them was that they will be operational by the end of June. dont know if that's confirmed. What happened to the Pasig river ferry service? Any update? i was planning to try it out tomorrow. is it working now?? Is the Pasig River Ferry still working? I don't think it's still in operation. I tried to go there(Escolta station) a couple of weeks ago. But it's now closed. Sorry guys.